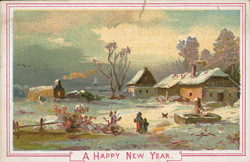 Sending seasonal greetings cards was a familiar idea by the end of the 19th century: many businesses, in particular, sent cards to their customers wishing them a 'Happy New Year'. The card shown here is from Messrs. Clifford & Co., a confectioners based in Southwark. 19th century confectioners took special care to tempt potential customers with an attractively presented shop window. Rows of glass jars filled with brightly coloured sweets were often displayed alongside cakes covered in beautiful decorations. Some of these cakes were made to look like meat dishes, like a boar's head or a pheasant. These were ‘trompe l’oeil’ jokes for the more wealthy members of society, and would have looked very striking indeed as the centre piece at a large dinner party.